We've long learnt to lower our expectations when the summer rolls round. It's a time that television goes on holiday and broadcasters roll out programmes they'd not get away with in the autumn. There are some exceptions to that rule and there's one show this summer that has been tugging on the nation's heartstrings every Friday. Gogglebox may dominate for the rest of the year but we've fallen in love with its younger sibling Gogglesprogs. After getting quite a good response when it aired on Christmas Day, this junior approximation of Gogglebox was given its own series for the summer. As somebody who thought the Christmas series was alright but thought it worked better as a one-off I was sceptical about how well a full run of Gogglesprogs would work. However, like most of the audience, I was won over by the innocent opinions of these junior critics and their natural reactions to programmes many of us had seen months ago. In some ways Gogglesprogs works better than its older brother as the subjects in this case aren't trying to think of the next funny line to say in order to get more airtime. Their commentary on shows such as The Getaway Car and Call the Midwife feels incredibly organic and just some of the reactions to the latter show were particularly heartwarming. I applaud Channel 4 for putting this on before the watershed as it does provide decent family viewing before the more abrasive comedy programmes come on afterwards. If I were to be overly picky (and you know that I like to be where possible), there is less of a selection of programmes for the youngsters to cast their views on so run-of-the-mill shows such as It's Not Rocket Science are reviewed long after most of us have forgotten about them. I don't think this matters too much especially when the highlights of Gogglesprogs for me is hearing the kids' unfiltered thoughts on the week's news events. 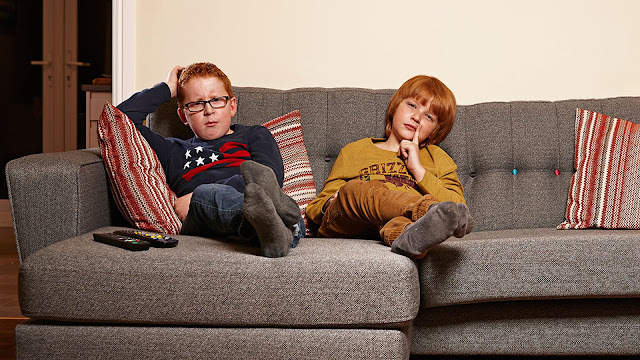 Just like with Gogglebox I am started to like some of the Gogglesprogs more than others and I think my favourites have to be friends Jacob and Connor who I feel are wiser than their years. Furthermore I like the idea of having the kids' parents just off camera providing their kids with advice and snacks amidst giving their opinions on what they've been watching. Similarly to its older counterpart, the sprogs have had the nation in tears especially when five-year-old Molly sobbed her little heart out as Simba's dad Mufasa fell to his death at the hands of evil scar. It hadn't occurred to me before how much of an affect the brutality of that scene in a cartoon would have on its young audience. Whilst I can't say I find Gogglesprogs as entertaining as Gogglebox is certainly more of an enjoyable watch thanks to the innocence of the youngsters and their candid thoughts on some of the biggest shows and events that have occurred over the past year. More than anything else It's a show that proves just how smart the children of this country are with some of their opinions being better-rounded than those given by their adult counterparts. Oh we love you Gogglesprogs!